Me & My Trusted Brand Contest - Reader's Digest ~ Philippine Freebies, Promos, Contests and MORE! 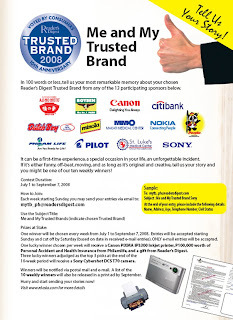 Tell Reader's Digest a story about one of their brand sponsors in Me & My Trusted Brand Contest. Prizes are given away every week and 3 Sony Cybershot for the best stories for the whole duration of the contest. Send your email entries now! No purchase necessary!